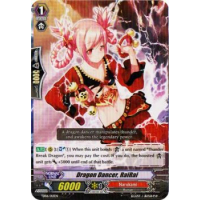 [AUTO](RC):[Soul-Blast 1] When this unit boosts ([Boost]) a unit named "Thunder Break Dragon", you may pay the cost. If you do, the boosted ([Boost]) unit gets [Power]＋5000 until end of that battle. A dragon dancer manipulates thunder, and awakens the legendary power.